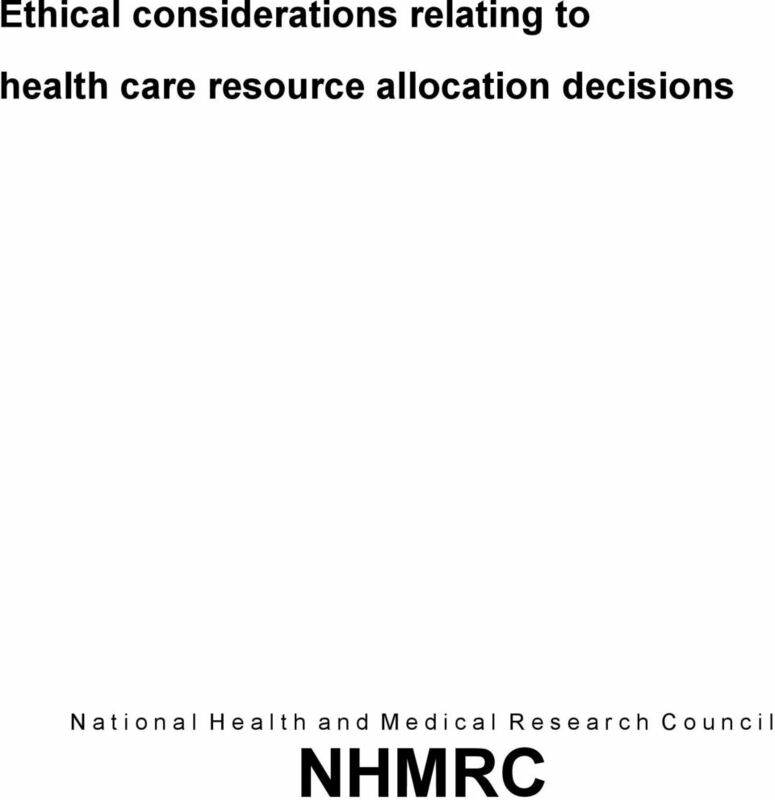 Download "Ethical considerations relating to health care resource allocation decisions"
2 Commonwealth of Australia 1993 Reprinted January 1999 as originally released in November This work is copyright. Apart from any use as permitted under the Copyright Act 1968, no part may be reproduced by any process without permission from AusInfo. Requests and enquiries concerning reproduction and rights should be addressed to the Manager, Legislative Services, AusInfo, GPO Box 84, Canberra ACT The objective of the National Health and Medical Research Council is to advise the Australian community on the achievement and maintenance of the highest practicable standards of individual and public health and to foster research in the interests of improving those standards. 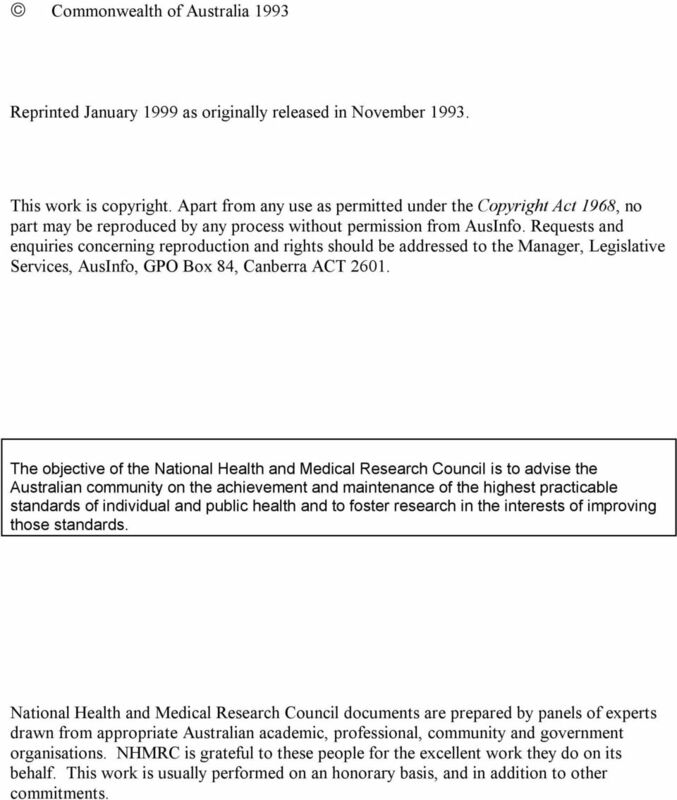 National Health and Medical Research Council documents are prepared by panels of experts drawn from appropriate Australian academic, professional, community and government organisations. NHMRC is grateful to these people for the excellent work they do on its behalf. This work is usually performed on an honorary basis, and in addition to other commitments. 3 Introduction The Australian Health Ethics Committee is concerned with the ethical implications of medical research and practice and of health care in general. 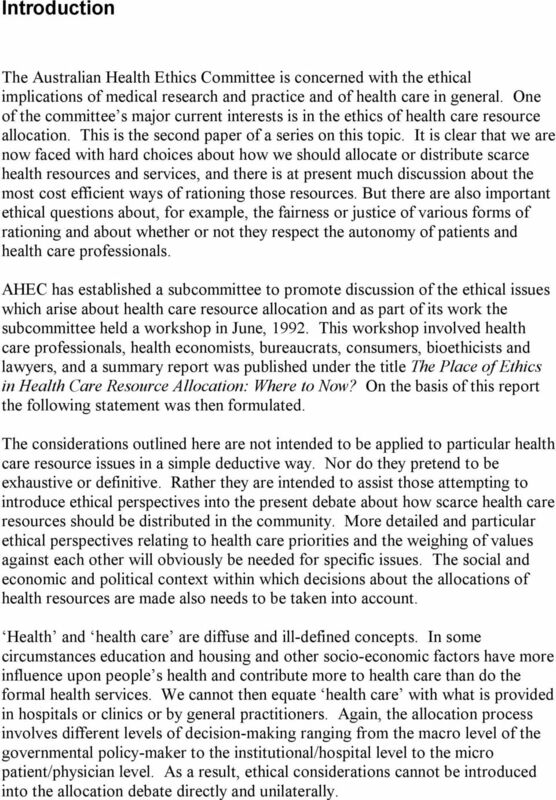 One of the committee s major current interests is in the ethics of health care resource allocation. This is the second paper of a series on this topic. It is clear that we are now faced with hard choices about how we should allocate or distribute scarce health resources and services, and there is at present much discussion about the most cost efficient ways of rationing those resources. But there are also important ethical questions about, for example, the fairness or justice of various forms of rationing and about whether or not they respect the autonomy of patients and health care professionals. AHEC has established a subcommittee to promote discussion of the ethical issues which arise about health care resource allocation and as part of its work the subcommittee held a workshop in June, This workshop involved health care professionals, health economists, bureaucrats, consumers, bioethicists and lawyers, and a summary report was published under the title The Place of Ethics in Health Care Resource Allocation: Where to Now? On the basis of this report the following statement was then formulated. The considerations outlined here are not intended to be applied to particular health care resource issues in a simple deductive way. Nor do they pretend to be exhaustive or definitive. Rather they are intended to assist those attempting to introduce ethical perspectives into the present debate about how scarce health care resources should be distributed in the community. More detailed and particular ethical perspectives relating to health care priorities and the weighing of values against each other will obviously be needed for specific issues. The social and economic and political context within which decisions about the allocations of health resources are made also needs to be taken into account. Health and health care are diffuse and ill-defined concepts. In some circumstances education and housing and other socio-economic factors have more influence upon people s health and contribute more to health care than do the formal health services. We cannot then equate health care with what is provided in hospitals or clinics or by general practitioners. Again, the allocation process involves different levels of decision-making ranging from the macro level of the governmental policy-maker to the institutional/hospital level to the micro patient/physician level. As a result, ethical considerations cannot be introduced into the allocation debate directly and unilaterally. 4 Ethical issues Justice and equity Justice is the primary ethical consideration in the area of health care resource allocation since justice is concerned with fairness or equity in distributing goods to people. Justice means ensuring that as far as possible the members of the community have equal access to basic health resources (though patients also have the right to have access to private health resources of their choice) and that all sections of the community get their fair share of those resources. Justice is not simply a matter of securing the greatest happiness of the greatest number of people, as though the needs of the majority were paramount. A just and equitable policy must also be sensitive to the needs of minority and marginalised groups who lack the social power to lobby for their share of health resources, and to gain access to them. Regard must also be paid to the impact of present decisions about health resources on future generations: this is a matter of intergenerational justice or equity. Again, a just health care policy or program ought to have regard to considerations of efficiency in the sense that scarce health care resources should not be wasted. 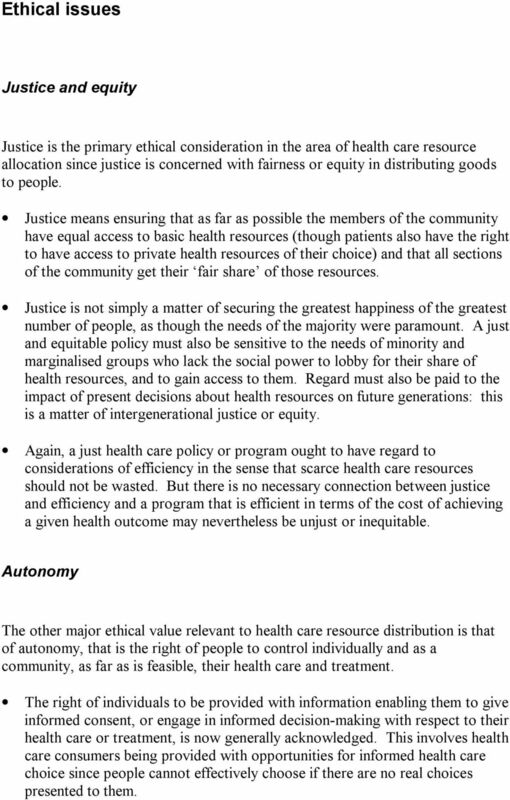 But there is no necessary connection between justice and efficiency and a program that is efficient in terms of the cost of achieving a given health outcome may nevertheless be unjust or inequitable. Autonomy The other major ethical value relevant to health care resource distribution is that of autonomy, that is the right of people to control individually and as a community, as far as is feasible, their health care and treatment. The right of individuals to be provided with information enabling them to give informed consent, or engage in informed decision-making with respect to their health care or treatment, is now generally acknowledged. This involves health care consumers being provided with opportunities for informed health care choice since people cannot effectively choose if there are no real choices presented to them. 5 The other aspect of autonomy is that professional health care providers have the right to exercise their skills according to the standards of good health care or good medical practice. The health care professional is neither the master nor the servant of the health care recipient, even though the final decision about health care or treatment rests with the recipient. The health professional has of course an ethical obligation to act in the patient s best interest. Getting the correct balance between patient and professional rights is difficult. On the one hand, patients have the autonomous right to consent to and exercise some degree of control over their health care, and health care paternalism (the health care professional knows best ) has to be avoided; on the other hand, health professionals have their own proper autonomy and rights which patients must respect. 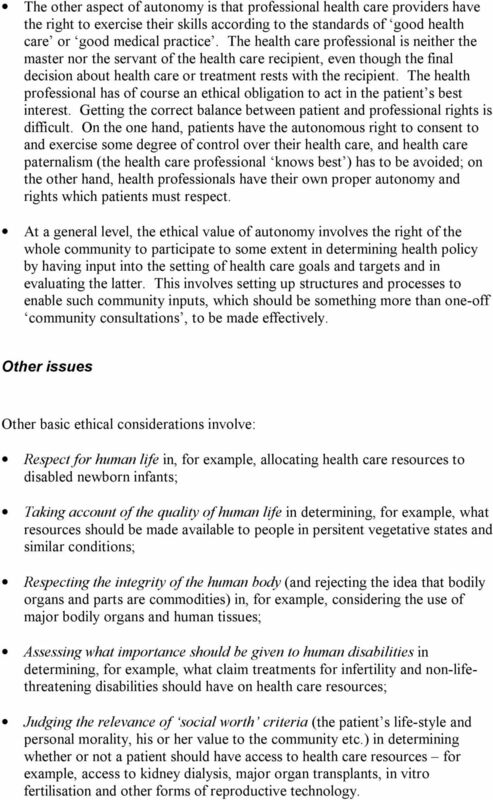 At a general level, the ethical value of autonomy involves the right of the whole community to participate to some extent in determining health policy by having input into the setting of health care goals and targets and in evaluating the latter. This involves setting up structures and processes to enable such community inputs, which should be something more than one-off community consultations, to be made effectively. Other issues Other basic ethical considerations involve: Respect for human life in, for example, allocating health care resources to disabled newborn infants; Taking account of the quality of human life in determining, for example, what resources should be made available to people in persitent vegetative states and similar conditions; Respecting the integrity of the human body (and rejecting the idea that bodily organs and parts are commodities) in, for example, considering the use of major bodily organs and human tissues; Assessing what importance should be given to human disabilities in determining, for example, what claim treatments for infertility and non-lifethreatening disabilities should have on health care resources; Judging the relevance of social worth criteria (the patient s life-style and personal morality, his or her value to the community etc.) in determining whether or not a patient should have access to health care resources for example, access to kidney dialysis, major organ transplants, in vitro fertilisation and other forms of reproductive technology. 6 Checklist The following list of questions offers a way of checking the ethical implications of any policy or program of health care resource distribution. Justice and equity Is this policy / project / program just or fair or equitable? Are considerations of cost-benefit efficiency being allowed to outweigh considerations of justice and fairness? Are sections of the community being denied their fair share of basic health resources? Are health care recipients being discriminated against on ethically irrelevant grounds of gender, age, race, nationality, religion, socio-economic status, social worth, geographical location, etc.? Are minority groups, which lack the social power to press their claims, being denied access to basic health care resources? Are some groups considered to be, in effect, outside the health care system because of their socio-economic status or other factors? Has consideration been given to our obligations to help meet the health needs of third world developing countries? Has consideration been given to the impact on future generations? Autonomy Is the right of health care recipients to control, as far as is feasible, their health care, being respected? Is this policy or project medically or bureaucratically paternalistic in that, in effect, it purports to tell health care consumers what is good for them without any kind of consultation with them? Are health care recipients being provided with effective information and counselling to enable them to give informed consent to, and to make informed decisions about, their health care? 7 Are health care recipients being given opportunities for choice so that they are enabled to make real choices about their health care? 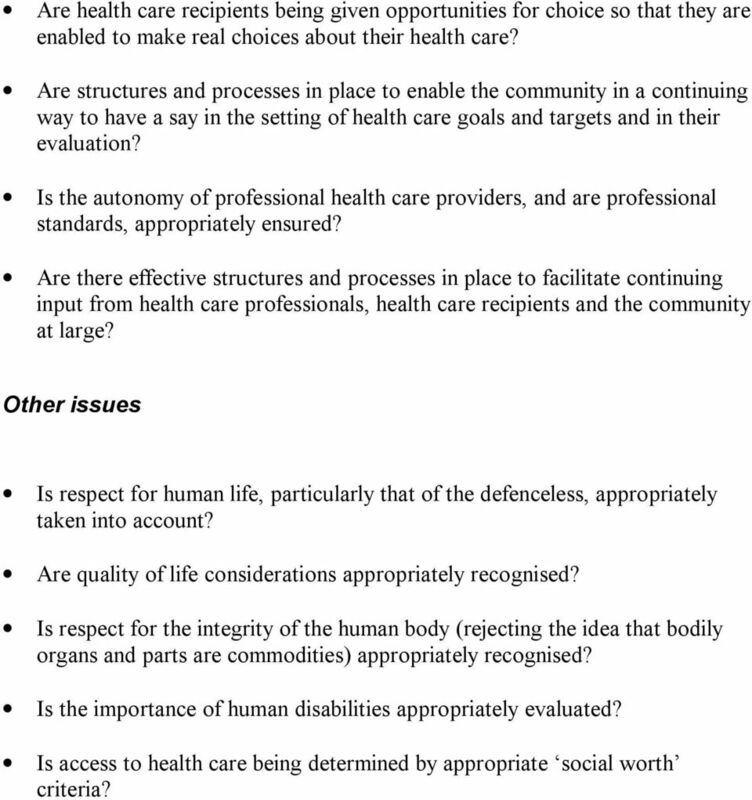 Are structures and processes in place to enable the community in a continuing way to have a say in the setting of health care goals and targets and in their evaluation? Is the autonomy of professional health care providers, and are professional standards, appropriately ensured? Are there effective structures and processes in place to facilitate continuing input from health care professionals, health care recipients and the community at large? Other issues Is respect for human life, particularly that of the defenceless, appropriately taken into account? Are quality of life considerations appropriately recognised? Is respect for the integrity of the human body (rejecting the idea that bodily organs and parts are commodities) appropriately recognised? Is the importance of human disabilities appropriately evaluated? 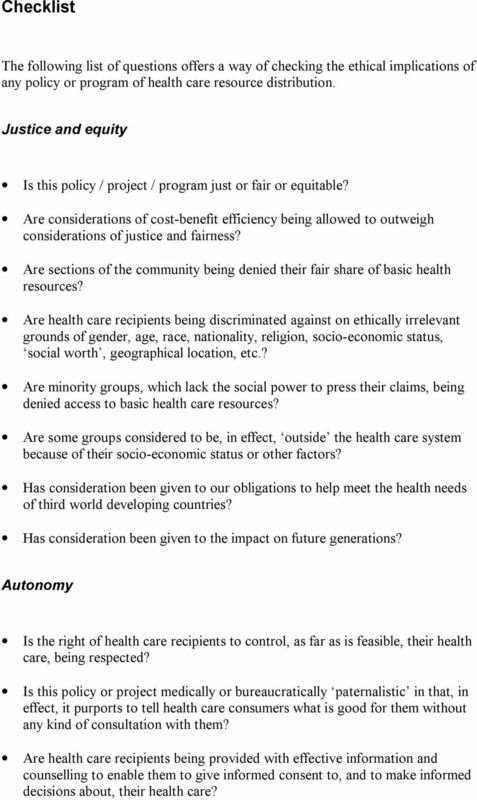 Is access to health care being determined by appropriate social worth criteria? Manage human This book supports BSBHRM501B Manage human in the Business Services Training Package. Veronica Ritchie, 2015 Author: Veronica Ritchie ISBN: 978-1-925291-02-5 Disclaimer All rights reserved. Professional Competencies of the Newly Qualified Dental Prosthetist February 2016 Australian Dental Council Level 2, 99 King Street Melbourne Victoria Australia Copyright 2016 This work is copyright 2016. ARCHIVED. When does quality assurance in health care require independent ethical review? hij Teacher Resource Bank GCE Religious Studies Unit A Religion and Ethics 1 Example of Candidate s Work from the January 2009 Examination Candidate C Copyright 2009 AQA and its licensors. All rights reserved. Draft Statement on Consumer Involvement in Health and Medical Research NHMRC Public Consultation: Post Submission Form Please complete this form and include it with your mail, email or fax submission. Nominations will be acknowledged via within 2 working days of being received by DSS. Urgent Issues Group Interpretation 1031 July 2004 Accounting for the Goods and Services Tax (GST) Obtaining a Copy of this Interpretation This Interpretation is available on the AASB website: www.aasb.com.au.